Upon arrival at this 2008 Olympiad host city, you will be greeted and transferred to your hotel. The rest of the day will be at your leisure. Nimen Hao! Welcome to China. The capital of the most populous country on earth, Beijing is a place where ancient history and the modern world combine. Although the original terminus of the Silk Route was Xi'an, the infamous Mongolian warlord Kublai Khan made Beijing his capital and extended the route to it. During the Ming dynasty two of the city's great monuments were built – The Forbidden City and the Temple of Heaven – which you'll visit later in the trip. 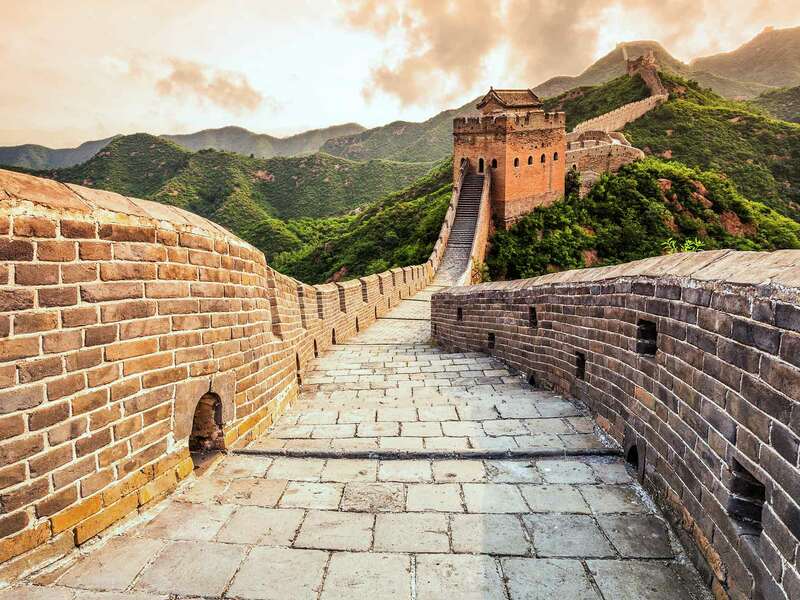 Today you will start your great China adventure with a visit to the Great Wall at the Mutianyu section, one of the world’s seven wonders with more than 2,000 years history. Enjoy some lunch at the local restaurant before heading back. In the evening, try some delicious Beijing Duck. This morning after breakfast, head out to discover the Chinese capital. Travel by public transport to Tiananmen Square, which is the largest town square in the world and big enough to hold one million people! Just next to the Square is the Forbidden City, once home to the Emperor and his family. The maze of buildings within the City became the symbolic and literal heart of the capital and the kingdom. Symbolism abounds here; dragon and phoenix represent emperor and empress, and construction followed the principles of Yin and Yang – the balance of negative and positive forces. Tonight we are in for a treat as we head out for a night of acrobatics at a Beijing acrobatic show. In the morning, visit China’s largest temple and altar complex as well as the city’s symbol – the Temple of Heaven, a masterpiece of Chinese architecture, set in beautiful surroundings where people enjoy tai chi, fan dancing, diablo, kite flying, water calligraphy and more. Afterwards take the relaxing Hutong tour (short line) and stop by a local family’s home and share some lunch together to get a better feeling of the life and people of this city. Drive back to the hotel for a little break before your guide will bring you to the railway station for your overnight train to Xian, also known as Chang’an (Ever-lasting Peace) and the most important city in China’s northwest region. Upon arrival your guide will welcome you and bring you to the Muslim Quarter. Explore the historical splendour of this ancient city on a walking tour. Dating back 6,000 years and once known as the main eastern terminus of the ancient Silk Road, Xi’an served as the imperial capital of 11 dynasties, holding a wealth of history within its cobbled pavements. Continue to the ancient City Wall. Dating back 6,000 years and once known as the main eastern terminus of the ancient Silk Road, Xi’an served as the imperial capital of 11 dynasties, holding a wealth of history within its cobbled pavements.In the evening, enjoy a Chinese Dumpling dinner. Xi'an is, of course, famous for the Terracotta Warriors, guarding the tomb of Emperor Qin Shi Huang. Although this vast army was buried some 22 centuries ago, it was only discovered as recently as 1974. Today we drive to the site (approx. 1.5 hours) which is spread over several pits. The sheer size of the assembled terracotta army and the excellent displays really feed the imagination. The amazing Bronze Chariots and Horses that were restored from over 3000 pieces when originally excavated on site are also on display. There is also an interesting museum housing a collection of artefacts from the original digs. After lunch drive to the railway station for your afternoon bullet train to Chengdu. Welcome to Chengdu! This city is most famous for two things – the pandas living in the mountains, and the food. Its hot, spicy dishes are considered by the Chinese to be the best food in China. In such a food-loving country, this is no mean feat! Spend the day exploring the Old Town and Tibetan quarters of this quaint provincial area. Go on a walking tour (2hours) with your leader to visit Tianfu Square, where a giant statue of Chairman Mao stands tall. Globally, Chengdu is famous for the panda research centre, which you’ll visit this morning. China’s national pride, the giant panda is a rare and increasingly threatened creature, but here you can witness the conservation efforts being made to save this endearing endangered species. The research centre is home to both giant and red pandas, and you can marvel at these incredible creatures in a close approximation of their habitat. It’s an early start as pandas are only active for a few hours of the day to eat and exercise, but the opportunity to get close to these remarkable animals is an experience not to be missed. Watch them play, eat bamboo and climb the trees. If you’re lucky enough you might even get to see newborns taking their first steps in the nursery (July-September). After lunch relax in one of the most popular parks in Chengdu, Renmin Park (People's Park), where you can experience the amazing Chengdu tea culture. Enjoy the local flavor hot pot dinner in the evening. Take the morning flight from Chengdu to Guilin. Then get transferred to Yangshuo with the beautiful view of the highway. Arrive in Yangshuo in the late afternoon and head out of the town with bicycles to visit the surrounding countryside. Start an hour Taichi lesson this morning after breakfast. In the afternoon, visit a local farmers' market, where you can get a feel for the regional produce and daily life. Then make a short drive to Chaolong, where you can put this new knowledge to use and learn the art of Chinese cooking. This class will allow the whole family to learn the techniques and skills of Chinese cuisine from experienced chefs, and after an afternoon trying out delicious recipes, you can eat what you’ve made for dinner! With recipes that are easy to make and ingredients readily available outside of China, you’ll soon be wowing friends and family back at home. After breakfast, your guide will bring you to the aiport for your onward journey or return home.